30 fun, engaging video lessons (plus cooresponding memory videos) are done for you. All you have to do is show up to class and push play. You’ll be given access to hands on projects you can do in class, or send the instructions home with the students to do with their families! Explore living books using the recommended reading list. Each lesson includes several recommended books. Choose one of those books to read together during class time. 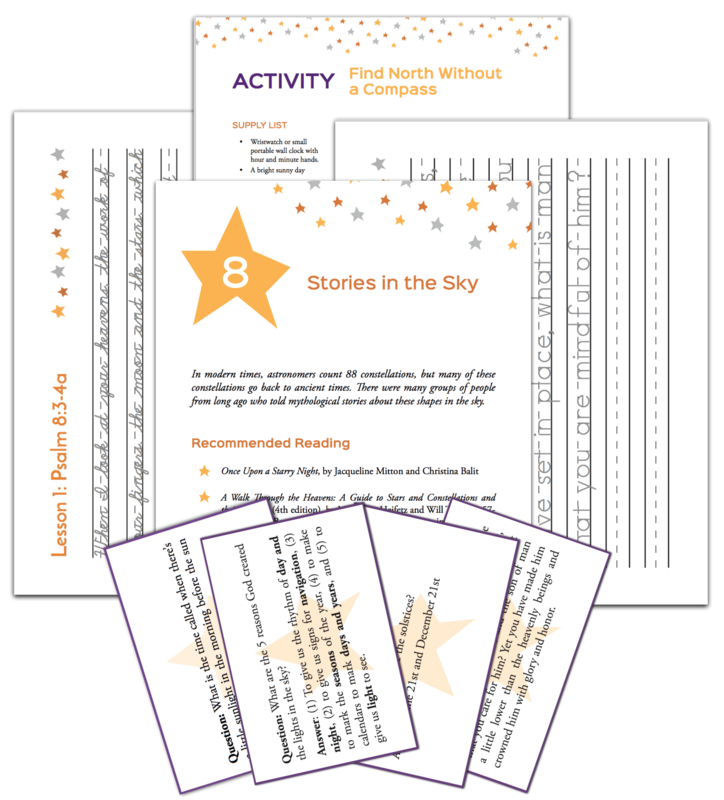 Use the copywork pages in class to help students think more deeply about how astronomy interacts with the Bible and history while also practicing their handwriting! Each co-op pays a flat fee of $100 per group. In addition they pay a per student fee of $25. Registration for 2018-2019 School Year! Ready to get started? You can register for the Elementary co-op course now. No. While you should watch the lessons in the correct order, the elementary level lessons can be completed any time of year. You’ll have access to the course beginning May 1st and access ends June 30th of the following year. This should allow you time to preview lessons and prepare for your school year. If your co-op follows a non-traditional school year please contact us and we can try to determine an alternative solution for you. Do we need to watch the videos together as a class? Yes, the video lessons are the heart of the course. The facilitator should play the videos during class time. No, there are no required textbooks. We do however have a recommended reading list. We recommend teachers choose one book from the list per week to read together with their class. What grade/age is this course for? The course is geared towards students age 6-11 (or first through sixth grade). We recommend using our upper level course for older students.